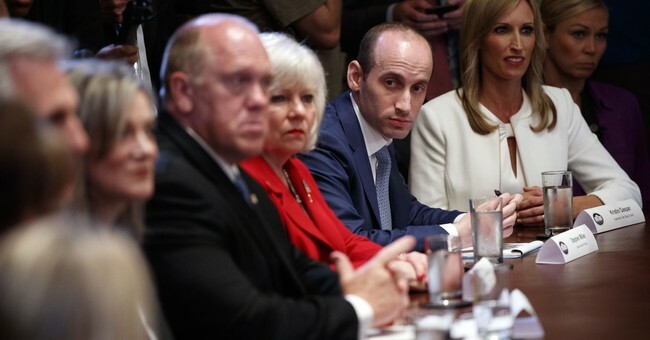 White House senior political adviser Stephen Miller's third grade teacher is out with a new op-ed criticizing him for his adolescent behavior. While a student at Santa Monica's Franklin Elementary school, Miller was a loner and ate glue, his former teacher Nikki Fiske regretted. Do you remember that character in Peanuts, the one called Pig Pen, with the dust cloud and crumbs flying all around him? That was Stephen Miller at 8. I was always trying to get him to clean up his desk  he always had stuff mashed up in there. He was a strange dude. I remember he would take a bottle of glue  we didn't have glue sticks in those days  and he would pour the glue on his arm, let it dry, peel it off and then eat it. His behavior was so alarming that she had to have a conference with his parents. How this is all relevant to 2018 or his work in the White House, I have no clue. While many Trump admin critics were gleeful to see his elementary school teacher roast Miller and expose his strange habits as a kid, others asked, seriously? I ate Playdoh once in first grade on a dare for a Jolly Rancher. Are we seriously doing this? Even those who don't like Miller what Ms. Fiske did was just plain wrong. I also heard when he was an infant he soiled himself. I remember he would take a bottle of glue  we didn't have glue sticks in those days  and he would pour the glue on his arm, let it dry, peel it off and then eat it. He should call a press conference, now, and do this - just to freak people out. I heard that one cabinet member called a fellow student in first grade a poopie head. I admit it, I used to like the taste of paste back in early grade school. Heck, once in first grade my teacher taped my mouth shut and took me to the other class rooms to show other students what happens when you talk in class. When Stephen Miller was in high school, he would be a guest many times on the LA radio stations, particularly the Larry Elder Show. He would almost take over the show with his knowledge & political views. He was very conservative then - a rarity at SaMo HS. You could tell then, that he was destined for great things. With rat fink teachers like this, no one needs teachers. While an infant he also drooled! Thanks for your post, that speaks volumes and am not surprised. I ate paste and peed my bed and picked boogers. They would go back to the womb, but they deny that the unborn baby is human. If they go back that far for normal people, they have to go back to bammy’s childhood, when he was brought up as a muzzy. She's just following Hitlery's orders. Id like to know more about Ms. Fiske..
At first I thought this was satire, but it seems it isn’t. This is a huge ethical violation by a teacher. You aren’t supposed to discuss your students’ behavior, academics, pretty much anything outside of the staff and the student’s parents. If this woman is still working as a teacher, she should be fired. I had some liberal teachers. If I became famous like Steve, they would not be saying bad things about me to the whore media. The public screwell system has really disintegrated. He obviously had cooties. Look how far away the other kids are standing next to him. I thought it was satire when I read the headline. The moron teacher should shoved (not asked) out of the profession for cooperating with this. Didn't she molest little boys and girls, too?